← Quick plays: HEYLEL, P.O.D. 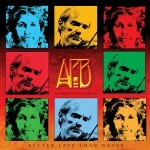 Share the post "Album review: ANDERSON PONTY BAND – Better Late Than Never"
The album features two legendary musicians, former Yes vocalist Jon Anderson and violinist/jazz composer Jean Luc Ponty. The idea for these two musicians to work together was first mooted back in the 1980′s, it is only recently that it came to fruition, hence the album’s title. The album is a studio album taken from a live recording and Anderson and Ponty are backed by Jamis Glaser (guitars), Wally Minko (keyboards), Baron Browne (bass) and Rayford Griffin (drums/percussion). The set list is a mixture of Yes and Ponty classics, with a new composition ‘Infinite Mirage’ which takes part of Ponty’s song ‘Mirage’ as its foundation. Yes purists may splutter and wail as the Yes songs are given a total reworking and for the most part work really well. ‘Owner Of A Lonely Heart’ has a jazzier feel, as Ponty’s violin playing is an important part of each song as much as Jon Anderson’s wonderous vocals. Speaking of wonderous, the Yes classic ‘Wonderous Stories’ gets a whole new life with the arrangement on here, again a little jazz in the overall sound but not too much. This entry was posted in ALBUM REVIEWS, ALBUM REVIEWS (Mobile), All Posts and tagged album, Anderson Ponty Band, Better Late Than Never, jazz, Jazz rock, Jean Luc Ponty, Jon Anderson, prog, review, rock, violin, Yes. Bookmark the permalink.